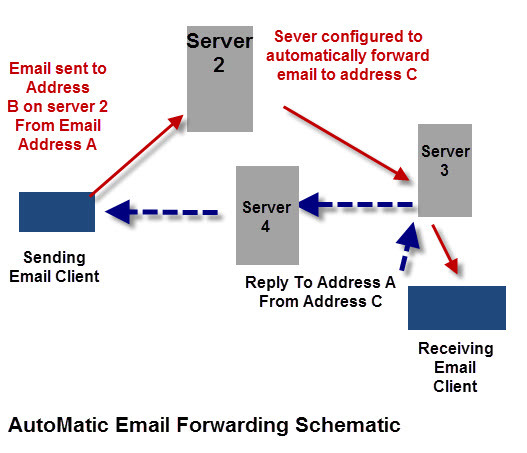 With Automatic email forwarding email sent to an email address is automatically forwarded to another email address as shown in the schematic below. Consolidate all email addresses into a single mailbox. Send a copy of an email to someone else, or another mailbox. As a temporary measure when transferring email providers. If you are moving,for example, from Yahoo Mail to Gmail you can configure Yahoo mail to automatically forward email from Yahoo Mail to your Gmail address. The schematic below shows the forwarding process and also the reply process. Depending on how email forwarding has been setup on server 2 a copy of the email may be stored on server 2. Automatic email forwarding is usually done on an email server, but automatic email forwarding from an email client is possible using message rules. If you have an email account with Yahoo, Google or Outlook.com then email forwarding is part of your email options. If your email account is part of a web hosting package,or email hosting package, then it is managed through the hosting control panel. If the mailbox is on a corporate server (i.e. Exchange) then this is normally done for you by the email administrator. Forward and keep a copy. Forward and don’t keep a copy. Forward on conditions (i.e. selective forwarding). Login to Yahoo Mail and go to Options>Settings. Select your email account, and click edit. 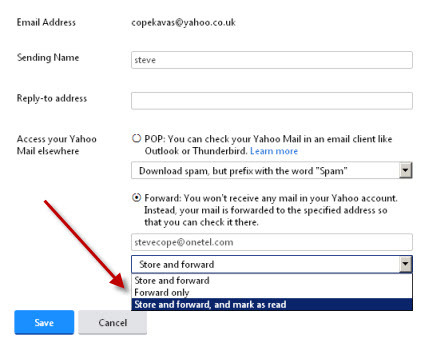 Enable forward option and add the destination email address, and select the forwarding option from the list. Although the Yahoo text says that the mail will be forwarded, and not stored in your inbox, it will, if you select the store and forward option. Gmail requires you to confirm ownership of the mailbox you are forwarding to before you can auto forward email. Open C panel and go to forwarding. Select the address you want to forward and the enter the address you want to forward to. When email is forwarded at the server level then the final recipient sees the original sender as the email sender, and not the intermediate address. This means that replies will be sent to the original sender. 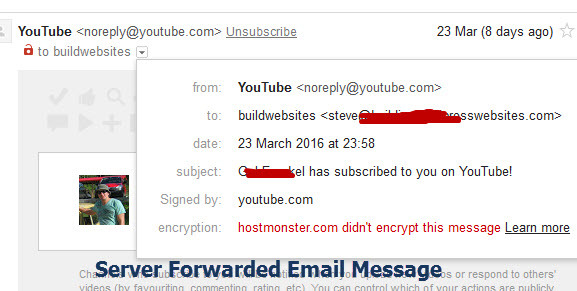 The screen shot below shows a message sent from YouTube that has been forwarded to the Gmail account. Notice that the message comes from YouTube, and so replies will also go to YouTube. The main problem is that it can cause confusion with the email sender as they send an email to address B but get a reply from address C.
This is the main reason why it is usually only used as a temporary measure. However some email systems can be set up to send email from alternate addresses which overcomes this problem. You will find many companies offering forwarding services. They usually work by connecting to your mailbox reading the email, and then sending it (forwarding it) onto a email address of your choice. Because of this they can forward email from multiple email addresses/mailboxes to a single email address/mailbox. Because they are connecting to your email mailboxes they will need to be configured with the account details (address, account name and password etc) just like a normal email client. You can also usually choose a sampling period, which is basically how often they read your mailboxes to check for new emails. A- Yes they all support email forwarding. However remember free accounts will expire if they aren’t used. I don’t think that forwarding email counts as using it as you haven’t logged in. Q- If I forward email from Yahoo to Gmail Is my Email deleted from Yahoo? A- It depends on how you set it up. Q- Can I automatically forward only particular emails on Yahoo, Gmail or Outlook.com? A- No- when you enable forwarding all emails to that address are forwarded.